Syma has been a manufacturer of quadcopters for more than 10 years. They are known for making drones for kids, radio-controlled quadcopters, and FPV drones for more advanced flight experience. Syma makes both indoors and outdoors drones. Most Syma’s are affordable and easy to fly. Many Syma drones feature 3D eversion with a push of a button, and illuminating built-in LED light for night flying. If you are looking for a fun tech gift, check out our featured Syma drones for kids and adults, beginner to experienced pilots, and various budget – under $20 to $200. 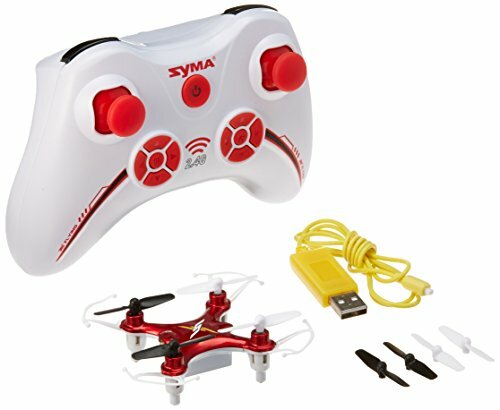 Syma x12 Nano RC quadcopter is a great toy drone for a child or a beginner to get familiar with controls before moving up to a bigger drone. 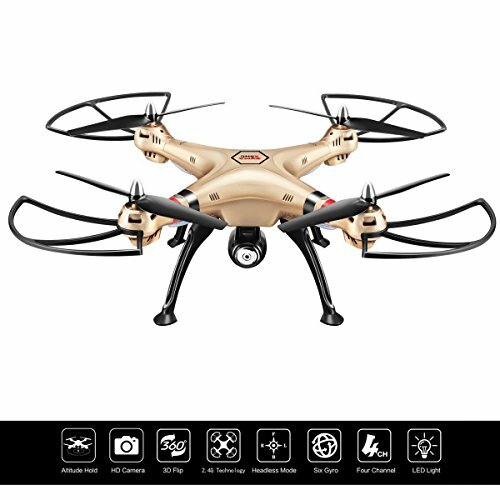 It is an affordable (about your lunch money) Nano drone with some good features such as 6-axis gyro, a well-designed RC controller, 2.4 GHz technology adopted for anti-interference, and the bright front LED (helps flying at night). Flight time is 5 min. We especially like its Xbox-like ground controller – it helps a beginner to learn controlling the quad easier than some other tiny controllers. We also like the 4 rubber feet that absorb shock when the quad lands and the soft landing makes the Nano more durable. It has the 2.4 GHz technology adopted for anti-interference, and with this feature you can fly several Syma x12 Nano drones at the same time without interference with other quads. Syma X11C RC Quadcopter is an affordable drone under $50 and a great way to get into FPV (First Person View) flying for a 10 year-old. FPV mode gives the pilot the ability to fly as if he/she were inside looking out the front. The viewer screen shows the view out the front of the copter. It has a flight time of 6-8 minutes. It has LED lights. 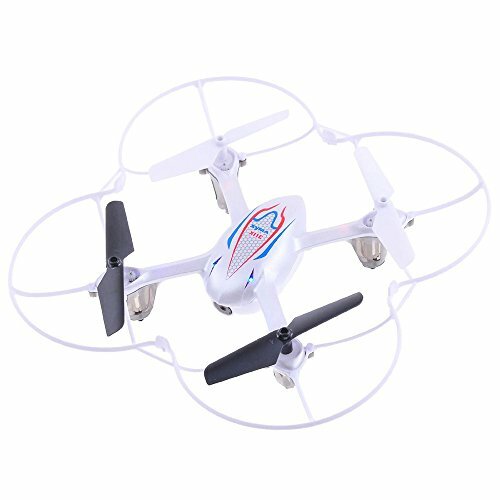 Syma X11C RC Quadcopter can do forward/backward, up/down, turn left/right, 3D stunt (yes, it can do 360 flip) and sideways flight. It has lights. SYMA X5C-1 Explorers 2.4G 4CH 6-Axis Quadcopter with HD Camera is big enough that it can be taken outside to fly. If you are looking for a tech gift under $60, this Syma is a fun quadcopter for any kid who enjoys flying outdoors. It has flight time about 8 minutes. It has blinking LED lights to help to keep it in sight. It does not have a camera. It has moves such as left/right, forward/backward, up/down, 360 flip and roll, sideways fight. The SYMA X5C-1 Explorers is also small enough that it can be flown in a large room indoors. Syma X5SW Explorers2 2.4G 4CH is one the very best quadcopters to learn on. Read our Syma X5SW review. It is light weight enough so that you can practice indoors without doing a lot of damage. It comes with spares for the parts that a beginner is most likely to break. It has 4CH flight controller with 6 Axis, 0.3 MP 480P camera, Ready to fly (just attach and tighten props). The right-hand controller can be configured for left hand throttle. Controller range is about 50 Meters. Flight time is about 7 minutes. It has a plastic body which is designed to be shatter resistant, another good feature for a beginner. The FPV camera gives the experience of looking out the front of the quadcopter’s nose. Since you can record the view, you can show it off later, too. This quadcopter will be a fairly inexpensive way to begin learning to be a drone pilot. 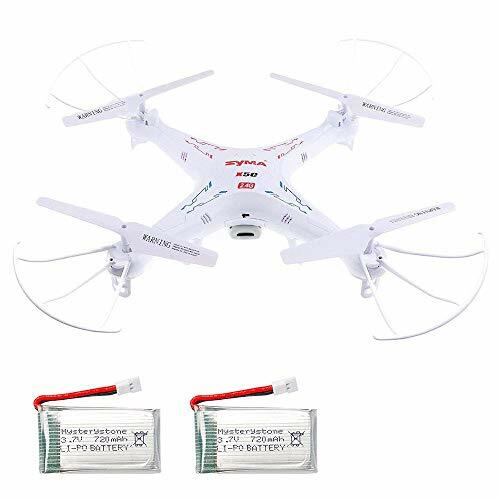 If you can fly a drone without crashing it every time, and you are looking for a drone that with ‘altitude and position hold’ feature, and a drone with camera, the Syma X8 series(X8HC, X8HW and X8HG) RTF drones is a great choice. Read our Syma X8HC review. The headless mode together with the excellent design 2.4 GHz channel communication makes the Syma X8HC an excellent rig for flying eversion (360 degree) roll, altitude and position hold. This is a fairly easy to control RTF drone – some can control the X8HC one handed! The LED on-board lighting means that you can fly it at dawn, dusk or after dark. 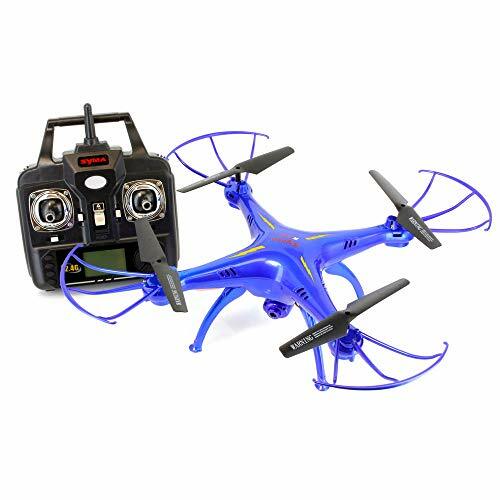 This adult sized copter has a low enough price that the cost of crashing will not break the bank. 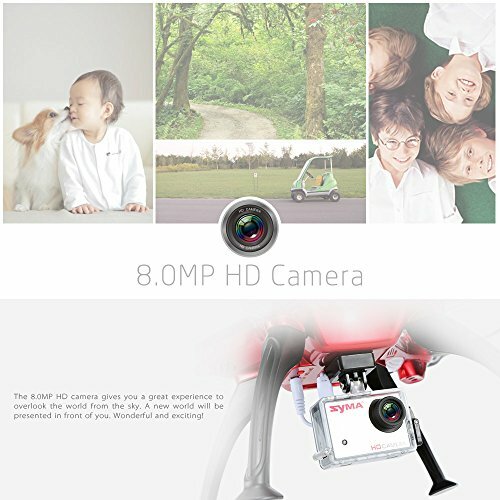 Syma X8HG 8MP HD Camera is an affordable, very good toy-grade aerial photography drone. Read our Syma X8HG review. The camera is 8mp HD and takes 1080P or 720P videos at 30fps. The 6 axis gyro helps to give you a nice stable platform and it has an anti-vibration camera mount. The ground station transmitter can control it up to about 70 – 100 meters (depending on terrain and weather). It has helpful features such as altitude hold, headless mode and a two flight speeds (high and low) for a beginner drone pilot. Syma X8HG is an indoor and outdoor drone. It can do 3D flips, forward/backward, up/down. Left/right sideways flight and it has illuminating LED light for night time flying.